This recipe smells soooo good while it is braising that it is hard to wait for the finished product! 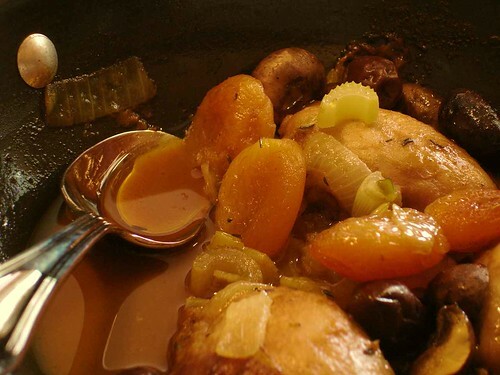 Luckily since we are using chicken, the braising time is fairly short, so you don’t have to wait too long before you can enjoy the tastes that go along with the exotic fragrance. Moroccan flavors are some of my very favorite. They combine the savory spices such as cinnamon and star anise with sweet flavors that come from fruit. 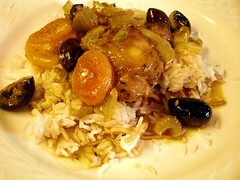 And there often is a salty element such as olives or cured lemons incorporated into the dish. And I am in love with the (I think) very romantic tagine – a classic cooking pot which also gives it’s name to the stews that are normally made within it. I have a tagine and use it fairly frequently but you can also replicate that process with any decent oven-safe, lidded cooking pan. A slightly domed lid is best as it will recirculate the accumulated moisture from the rising steam back onto the braise below. As is so often the case with my cooking this recipe can be varied in numerous ways. Just close your eyes and imagine the tastes you enjoy and then work them into this dish. Add a little olive oil to a medium-sized chef’s or saucepan that has a lid. Over medium heat sauté the onion and celery until just starting to turn golden. Remove from the pan and reserve. Mix the flour, Moroccan Beef Rub, paprika, salt and pepper in a shallow bowl. Dredge the chicken in the flour mixture and add to the pan, adding a bit more olive oil, if needed. Brown the chicken on both sides about 3 minutes per side. Once the chicken is browned leave it in the pan and add the wine, stirring gently to de-glaze the pan. 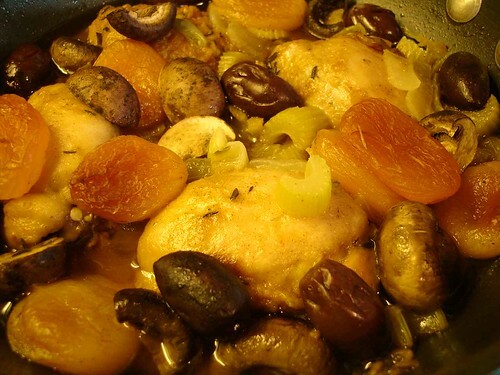 Add back in the onions and celery and then add the mushrooms, olives and apricots. Add enough stock to bring the liquid to 2/3 to 3/4 of the level of the chicken – you don’t want the chicken completely covered but more than 1/2 way. Cover the pan and bring the liquid to a boil. Place the pan in the oven for 1 hour. If your lid is loose on the pan, check the level of the liquid now and then to make sure it hasn’t all escaped. Remove from the oven and place one chicken thigh with some of the vegetables and fruits on each plate. Today I topped leftover steamed rice with the mixture which was really good! Note 1: I just happen to have this spice mix but you can easily make your own using all or some of the ingredients. This particular mix includes: ground cumin seed; ground coriander; Hungarian paprika; turmeric, white pepper, black pepper, fenugreek; dried ground ginger root; cayenne pepper; ground celery seed; ground cloves; ground caraway seed. The two most prominent flavors are the celery seed and turmeric. Note 2: Bone-in, skin-on thighs would also work, as would chicken breast of any variety. If you are using breast allow just a bit more time since they are larger. If you are using bone-in meat, allow a bit more time. If you are using skin-on meat you may want to skim the fat from the braising liquid prior to serving. If using breast meat you may prefer chicken stock to beef and you should definitely use a white wine.